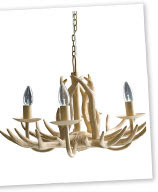 Freedom's antler chandelier, $399: hot or not? I've suddenly noticed a whole heap of deers and and their antlers used in decor at the moment. In fact, I even have some in my house - artwork, flat-pack wood deer head... But the real trend is in the antler lamps and chandeliers. Freedom have jumped on the bandwagon and have no less than three versions of antler lighting. Freedom's antler table lamp, $169. 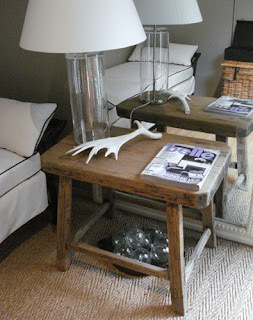 A floor lamp and pack of two antler decorations ($89) are also available. I personally quite like the sculptural element of them and the fact they're not REAL antlers (well, I really hope so anyway), but wonder if they'd overpower a room a little too much. What I do like, is how random (again, hopefully fake) antlers as decoration have sprung up, replacing driftwood as the coffee-table nature display of choice. I've considered buying a nice white one like the one above to pop against the brown wall in my living room. But my question is: would this, along with a real cow hide (which should be arriving any day) and numerous animal-print fabrics throughout my house and, um, deer stuff as mentioned above make me look like a crazy wildlife hunter? Or do I already look like one? Because I most certainly am not one of those... I just happen to like these items from nature in a home environment. And aside from the hide - which, well, let's just say will come from a multi-purpose cow - none are real. But I'm curious, what do you think about these animal trends that keep popping up? Just stummbled across you on via Apartment Therapy - funny given we both appear to be on the Central Coast in NSW. I love the combined nursery/master bedroom - it looks very calm and serene (very important when a new baby is screaming the house down). I hope 'pud' has made an appearence by now. I was hoping to clarify for you that deer antlers are shed every year without any harm to the animal -- fear not!! Unless they are still attached to the skull, (in which case they have been either killed or died of natural causes), they are renewed every year as a completely natural process. I hope this puts your conscience at ease and clarifies the antler debate.